PennsylvAsia: "Peppa Pig Celebrates Chinese New Year," February 5 and 6 in Pittsburgh. "Peppa Pig Celebrates Chinese New Year," February 5 and 6 in Pittsburgh. In the Chinese Lunar New Year, 2019 is the Year of the Pig. In a new episode of "Peppa Pig," the namesake character is learning a lot about the holiday as Madame Gazelle teaches everyone in her playgroup about the traditions. 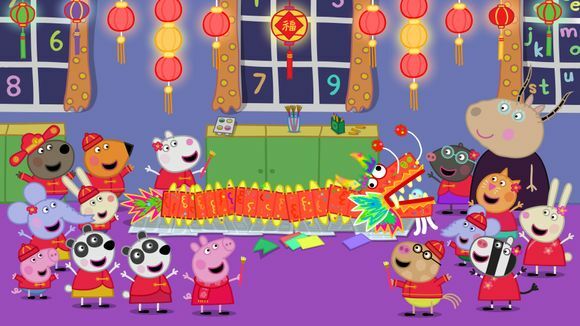 The show features Peppa's group making a dragon costume, Chinese lanterns and fireworks. Two new characters also are introduced, Peggi and Pandora, who are the twin daughters of Police Officer Panda. Showtimes and ticket information---there are six screenings in all---is available online. The theater is located at 300 West Waterfront Dr. in the Waterfront shopping complex in Homestead (map), across the Monongahela River from Greenfield, Squirrel Hill, and the rest of Pittsburgh.